This section includes a complete antique china (& fine china) free online guide in the format of an A to Z listing of firms. You will then find the guide sub-divides and automatically links to further sub-sections of "Bone China Makers" and "Modern Fine China Manufacturers (those factories founded after World War 2 in the second half of the 20th Century). You may want to have a glance at the page below to understand how to get the best out of this section on the site (now over 1500 pages of information). 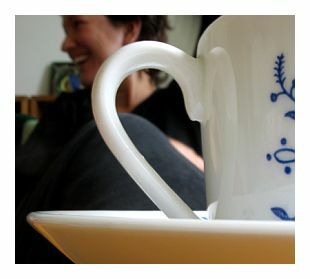 I tell the background stories behind the world's leading fine china makers in UK, Europe and USA. When they were formed, who established them, and what their mojo was all about - intended as a quick connoisseur's guide, which gets to the heart of it, not a dry, in depth history. You may also want to use the in-house search function to find some specific information, like a pottery mark you can't identify, for example, or a particular maker's history. If all you have is an obscure pottery mark with no company name, use the search box to describe the mark as best you can. Try several different versions of the search term descriptions, as you might just get lucky a second, third or fourth time. As a general rule, people think of bone china being an English type of ware, which in the main it is. The English company Spode finally got the recipe perfected in 1799. After that, other English makers followed. On the European continent, the makers were mainly concerned about emulating the great German firm of Meissen who had finally discovered the long hidden secret of true Chinese porcelain in 1710. So, if you were wondering, the difference between porcelain and bone china is that bone china is essentially porcelain with ground bone added. Bone china is whiter, and some say a big stronger, although that is disputed. 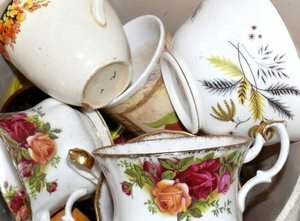 Other non-English firms did go onto become famous bone china makers, like Knowles Taylor Knowles of Ohio which won many awards for their fine bone china before their untimely demise and European makers Rosenthal and Villeroy & Bosch who both have significant bone china ware in their modern collections. Within the guide, I include all of the notable makers, many of whom are household names, but some of which no longer are. This is because, if they used to be big producers, even though they are pretty much unheard of nowadays, they would have produced a lot of stuff and therefore, people are likely to have their wares and be searching for who the heck they are and whether their stuff has any value or not. What about the smaller, less known firms? There are many hundreds of small pretty obscure antique china makers who are not included in the main section, but come up for discussion in the china chat forums. So, for these, again, use the search box above and get hunting. The reason the smaller or lesser known makers are not covered in the main listings is because with all the tiny firms included, the listings would be impossibly long. Instead they are written about in the public forums which have over 1500 pages of information - mainly guided by your common queries. Think about the main list as listing the major names. If you feel a major name is missing, please let me know. Continue onto . . .
Rice bowls Blue and white. Unidentified marks. Delft or German manufacturer? Unknown blue crown mark. Boy with Watering Can - does any one know who made him? Deco Style Colclough China Mark "Made in Longton"
Antique and fine china query - jasper ware style Serpent jug - John Turner of Lane Ends c.1785-1800? Antique & Fine China Collectibles Query - Blue Crown over an "H"
Anitique China & Fine China Query - Japanese tea set or not? What to look for when buying antique china.